Today we witnessed an incredibly impressive effort given by Leopold König (NetApp-Endura), in the final 100 meters of the climb up Mt. 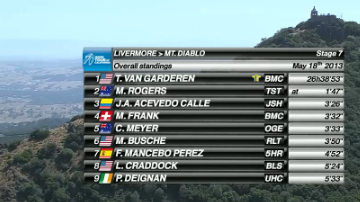 Diablo, to win Stage 7 of the Tour of California. Janier Acevedo Calle (Columbia) nudged Cameron Meyer off the GC podium to take 3rd overall after Tejay van Garderen (USA) and Michael Rogers (Australia). After seven days of racing, we are getting a true picture of whose form is coming in nicely. 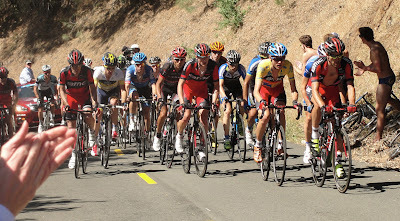 Key riders use the Tour of California as training for the Tour de France in July, and the ability to respond to small accelerations is a good sign of rider form. Now I wouldn't call König's final effort small, I would call it dominant; he deserved that win today. The BMC team bus that can be seen rolling down the highways in California this week. The mountain brought changes to the GC today. KEY FEATURES: Departing the city of Livermore, the peloton rode out Morgan Territory Road, Patterson Pass Rd, looping back through Livermore for a sprint, then followed a break of 10 riders to the final climb up Mt Diablo, with Acevedo and König leaving the rest behind before König showed an amazing burst of strength pulling away from Acevedo for the finish line. Katie Strausser was out on the road of Mt. Diablo today and captured these photos. Have you been watching Tour Tracker? Amgen Tour of California took on Mt. Diablo today for the first time ever in the races history. 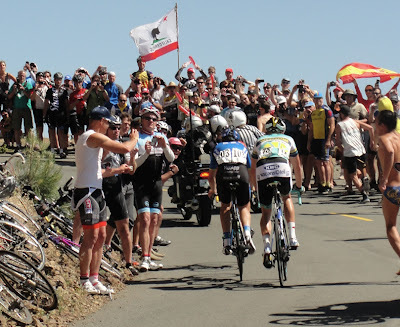 A well-known climb to northern California cyclists, the peak is visible from most of the San Francisco Bay area and is one of The Big 3 climbs in the Bay area. The road to the top of Mt. Diablo is a State Park road with permitting and public use restrictions. The peak of Mt Diablo rises 3,864 feet (1,178 m) above sea level and receives snowfall in winter. Access to the top is possible via the North Gate Road or the South Gate Road. The course record for the climb is 43.33 (from the Athenian School in Danville), set by Nate English on October 5, 2008. The women's record is held by Flavia Oliveira, set in 2012, with a time of 48'13". 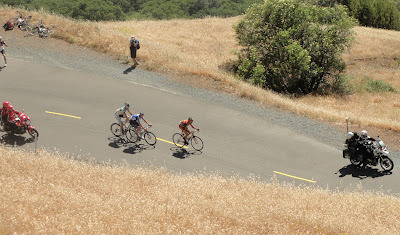 The Mount Diablo Bicycle Challenge is an 11.2 mile timed bike ride, climbing up South Gate Road 3,249 feet to the summit, it is held annually on the first Sunday in October. The next Mt. Diablo Challenge will be Sunday, October 6, 2013, register now. The year after Nate English set his fastest ascent record, my nephew Kenny Rakestraw, won his age group (19-29) and came in 1st overall for the entire race (47.10.07), at age 21. 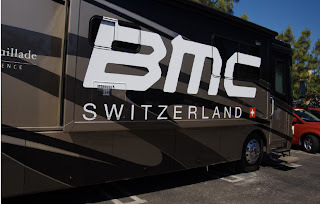 That same year Kenny won Mt Evans Hillclimb race (SM4) in Colorado, in a time of 2:05:31. Read more about the history and details of Mt. 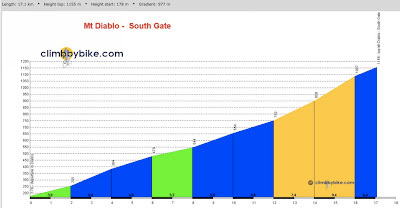 Diablo, on the ATOC official website: Mt. Diablo. Yes! 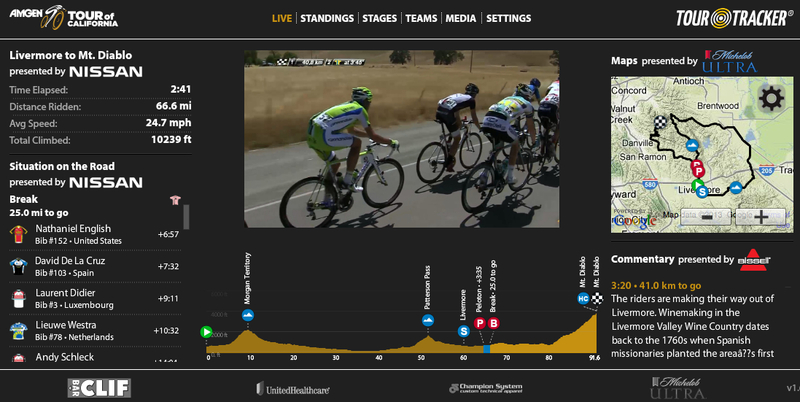 We have a HC (Hors catégorie) climb in California! Seems I missed a very scenic press conference on the summit of Mt. Diablo! KEY FEATURES: San Francisco, departing across the bay with a rolling traffic break over the Golden Gate Bridge (at approx. 8:20.a.m.) (the bridge sidewalk will be open to spectators), into Sausalito, up beautiful Highway 1, Point Reyes National Seashore, Occidental and ending with two finishing circuits in Santa Rosa. Done. 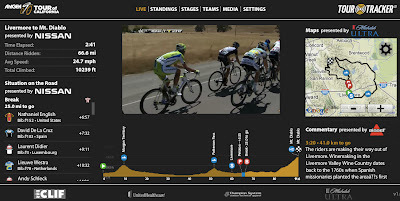 111 riders will start the 8th and final stage tomorrow morning in San Francisco. 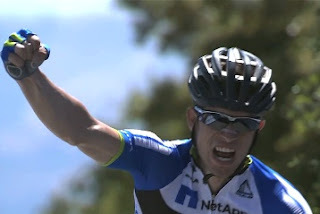 Tour of California Finale - watch it LIVE!